The VIC-20 is something of an unsung hero in the home computer world. Launched in 1981, it was Commodore's answer to the Atari VCS and Intellivision consoles. But with the addition of a real keyboard it offered a colour computer at an amazing price (under $300 in the US). It was the first home computer to sell one million units and at the height of its popularity they were churning out over 9,000 units a day. So why is it now treated like your embarrassing uncle with the ill-fitting wig? Well mostly it's because of it was overshadowed by it's flashy little brother the Commodore 64, but it really is criminal to miss out on some classic games from the dawn of home computing. If we fast-forward 20 years to Finland, we find a near legendary coder/musician from the Amiga Demo scene going through some form of electronic regression back to the (8-bit) womb. 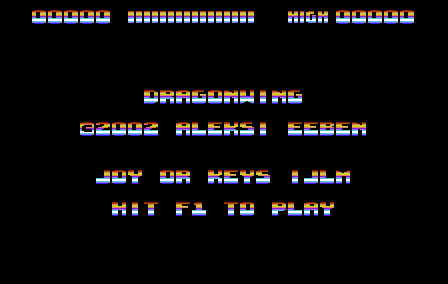 Moving backwards through the Commodore hardware catalogue, Aleksi Eeben creates a game on the humble unexpanded VIC-20 and it is quite simply hard to believe that it could all be done in just 3.5k! 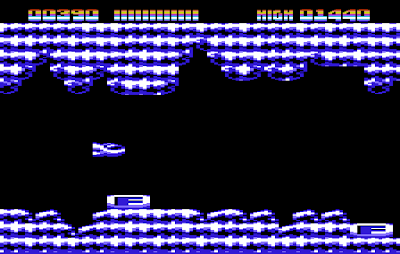 The game is Dragonwing, a side scrolling space flight, where your goal is to fly your beautifully drawn ship through subterranean caverns at high speed. First glance suggests a simple Scramble clone (of which the VIC has many), but you soon find that the game isn't that complicated! Your only enemies are the jagged cave walls and the strong gravitational pull and as the screen constantly scrolls smoothly to the left you must use your thrusters to navigate through the crevices, picking up fuel pods as you go. And that's it! What lifts this game above its peers though is the outstanding music and fantastic graphics. 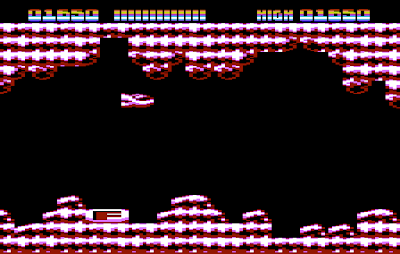 Sure the trademark Commodore blocky look is in full effect, but the smooth scrolling and excellent atmospheric use of colour is stunning. Eeben is already a well respected musician, so it's no surprise that the music is special. The title screen music draws you in with its thumping bass-line, but the trippy techno beat-fest played throughout each game is an outstanding achievement. Eeben has other VIC-20 games in his arsenal; all of which are worth a go or three, but Dragonwing is the peak and is quite possibly the best all-round package available on the unexpanded VIC-20. Download the game here (from the Aleksi Eeben's blog). Run it using VICE (freeware).